Maximilian I of the powerful Hapsburg family decided not to bother with the Pope‘s approval to be Holy Roman Emperor in 1508 AD. He thought the Hapsburgs were powerful enough to stand on their own. And so they were. Maximilian married everyone in his family to different rulers of Europe. So his kids inherited much more power than he had. Maximilian himself married Mary the Rich, queen of Burgundy and the Netherlands. 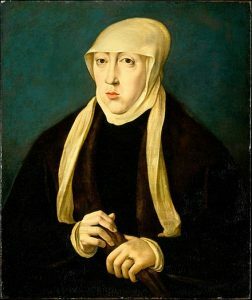 And Maximilian’s son married Joanna, the daughter of Isabella and Ferdinand of Spain. Who were Isabella and Ferdinand? When Maximilian died in 1519, his grandson Charles V inherited Austria and the Netherlands. 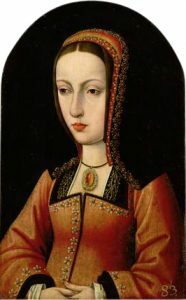 Charles’ mother was Joanna. She was now queen of Spain, but Charles kept her locked in a convent. So Charles V ruled Spain, and all of Spain’s colonies in North and South America too. What was going on in Mexico? 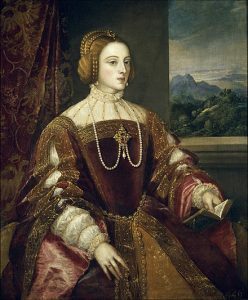 Titian also painted this portrait of Isabella of Portugal, who ruled Spain in the early 1500s. Because Charles V’s empire was so big, most of the time he left his wife, Queen Isabella of Portugal, to rule Spain for him while he ran the other parts. Isabella was the granddaughter of Ferdinand and Isabella. She dealt with the pirates of the Spanish and North African coast, and traveled around Spain organizing government works, using all the money that came from the Americas. In 1526, Suleiman the Magnificent, the new Ottoman sultan, invaded Austria’s neighbor Hungary. They succeeded in taking over the eastern half of the country. Charles’ brother-in-law, the king of Hungary, was killed in the battle. So Charles put his younger sister, Joanna’s daughter Mary, in power to rule Hungary as regent. But three years later in 1529, Charles V was able to defeat the Ottomans. So he added the western half of Hungary to his empire. A year later, Charles’ ships were sailing along the coast of California. Who were the Native people of California? At the same time, most of Germany was converting from Catholicism to Protestantism. They were breaking away from the Catholic Holy Roman Empire. Charles V did his best to stop this with the Counter-Reformation and the Jesuits and the Inquisition in Spain. But he couldn’t get Germany back. 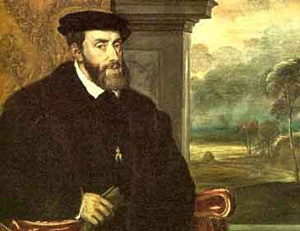 In 1530, he moved Mary from Hungary to being regent of the Netherlands. She kept the peace successfully. Then in 1540 Francis I of France convinced Suleiman to attack Austria-Hungary again. Suleiman conquered more of Hungary, and to keep the rest Charles had to agree to pay money to the Ottomans every year as tribute. Who’s Francis I of France? In 1555, Mary retired to Spain. Charles V retired the next year, when he was 56 years old. He split his empire between his sons. Philip got Spain, the Netherlands, and all the Spanish colonies. His brother Ferdinand got Austria-Hungary. Need a second source? Check out this article about Charles V from the Encyclopedia Britannica! Cite this page: Carr, K.E. Austria-Hungary – Charles V to Ferdinand. Quatr.us Study Guides, August 5, 2017. Web. April 18, 2019.